Razor bumps are caused by irritation and ingrown hairs that develop as a result of shaving. An ingrown hair occurs when it is shaved short and turns back into the skin. Any area of the body that is shaved is susceptible to razor bumps, including the buttocks. There are several ways to treat razor bumps, but it is also important to take steps to prevent them in the future by improving shaving techniques. Consult a healthcare professional for persistent bumps or razor bumps that bleed or ooze pus. This can be a sign of infection that needs treatment. Wash the area with an antibacterial body soap, including bar soap, in the shower and prior to treatment. The razor bump can become infected with bacteria, making the problem harder to treat. Rub the area gently with a clean, wet wash cloth or body loofah and warm water. This will help exfoliate dead or loose skin, encouraging an ingrown hair to come out. Soak a cotton ball in witch hazel. Rub the razor bumps with this natural astringent to aid in healing and reduce some itching if it exists. Let the astringent dry a few seconds before applying a thin layer of hydrocortisone cream to the bumps. Hydrocortisone cream works as a short-term itch reliever. The cream can also reduce inflammation. Apply a thin layer of antibiotic cream over the razor bump to fight infection and to help heal the ailment. Repeat the topical treatment once per day for up to four days or as indicated by the hydrocortisone and antibiotic cream tube. If the bump persists beyond a week, consult a healthcare professional. Avoid shaving the area while treating the bumps. 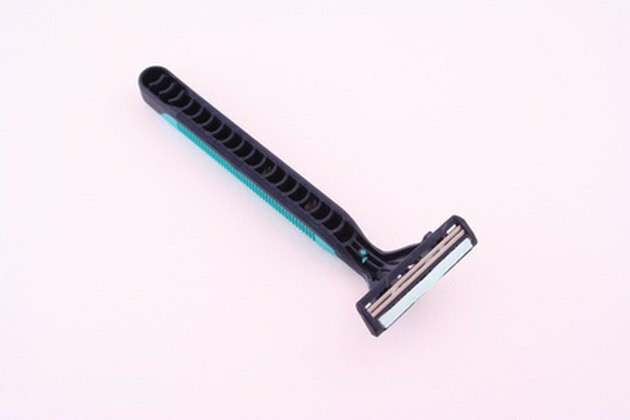 Clean the razor with a cotton ball wet with rubbing alcohol, or purchase a new razor. Bacteria my have built up on the razor, resulting in more frequent razor bumps. Prevent future razor bumps by wetting the skin with warm water and applying a shave gel, lotion or cream. Shave in the direction of hair grown instead of against it to reduce irritation. Go over the skin as few times as possible, as repeatedly shaving an area increases irritation. Pus or bleeding can indicate bacterial or fungal infection. It can also indicate folliculitis. These conditions may require over-the-counter or prescription treatment, such as an antibiotic or antifungal medication, to cure. Consult a healthcare professional for advice when these symptoms exist.